Happy Saturday Crafty Friends! 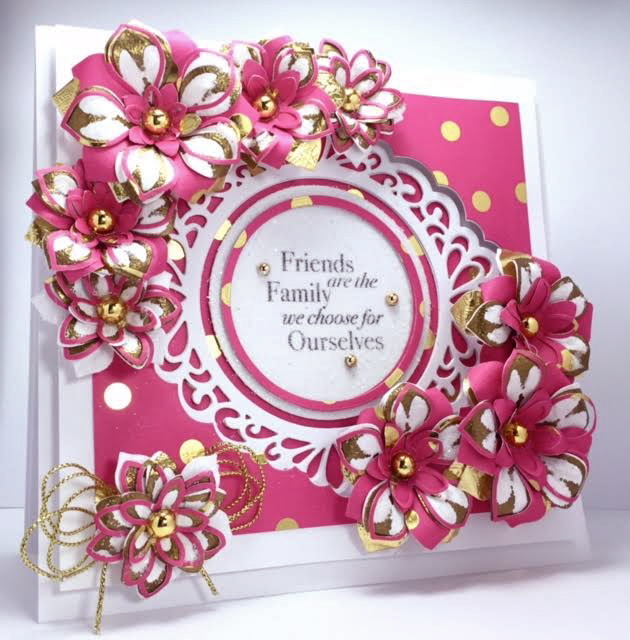 It's my turn to post for Creative Expressions and I have a Pink Floral make for you suing some fabulous dies by Sue Wilson. The flowers were stamped with Versamark then heat embossed with Gold EP. I then die-cut the flowers and multi Layered them. After doing that I took jewelry pliers and folded the ends of each petal and pressed centers in with a ball end stylus tool. for giving these their shapes. A Gold Half-Pearl sits in the middle of each flower matching the gold dots on the Designer Paper. The Sentiment sits in inside the raised framing and is covered with ultrafine white glitter for some sparkle and surrounded by mini-gold half pearls. Wow!!! Yoir flowers look just gorgous!! Fabulous card! This card caught my eye right away when I first saw it! All those dies so beautifully layered and the colors and flowers are breathtaking. Love it. wow this is gorgeous again America great colour choice and stunning flowers. This card is just gorgeous. Love the colours you used. These flowers are really awesome. Beautiful work team is. Love that pink paper it really pops. WOW, that's a whole garden of flowers, must have taken forever to put them all together, but what a beautiful card they made. 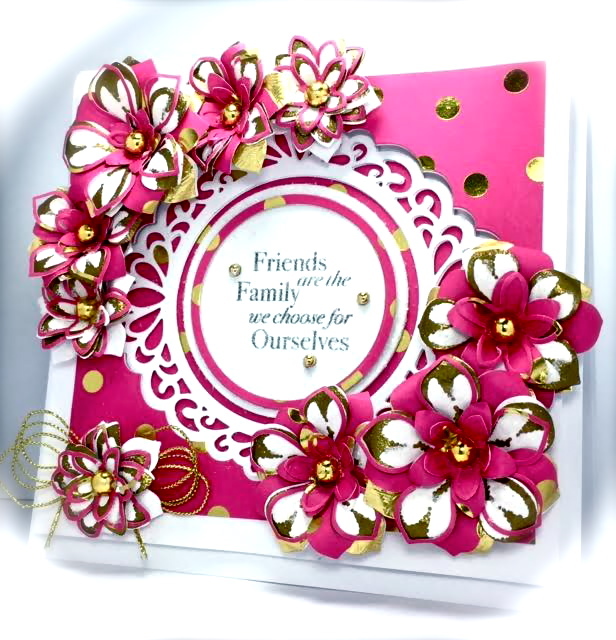 The colors are so bright and fresh, Stunning card. You and these dies were made for each other! !